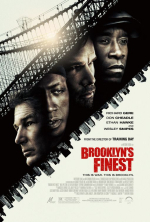 Wide Releases: Anton Fuqua returns to the world of urban thrillers in Brooklyn’s Finest, starring Richard Gere (looking like he did in the excellent Internal Affairs opposite Andy Garcia so many years ago), Don Cheadle (looking calm and steady), Ethan Hawke (the flip side of his character in Fuqua’s Training Day? ), and Wesley Snipes (graduating back to A-pictures?). Tim Burton’s Alice in Wonderland has been slammed quite heavily by critics; will the prospect of 3-D visual goodness still draw the punters? Still on the fence, though Burton in the director’s chair usually compels me to attend. Limited: Action sequel District 13: Ultimatum (Angelika Dallas). Special Screenings: Blaxploitation returns in Black Dynamite (midnight, Friday and Saturday, at the Inwood). See Steve’s review. Festivals: The Dallas International Film Festival announced its plans to honor director Pete Docter, as well as 12 more titles. The fest begins barely a month from now: April 8-18. I love the fact that I haven’t heard of most of these films, yet programmers James Faust and Sarah Harris always manage to pull out some good surprises. Mark your calendars and head to the official site to read more.